A few posts ago I teased you with some photos, and now it's time to share the recipe for those muffins many of your were so fond about. They are easy to make, and no stand mixer required. I personally do all mixing by hand. 1. Preheat oven to 375 F (190 C). 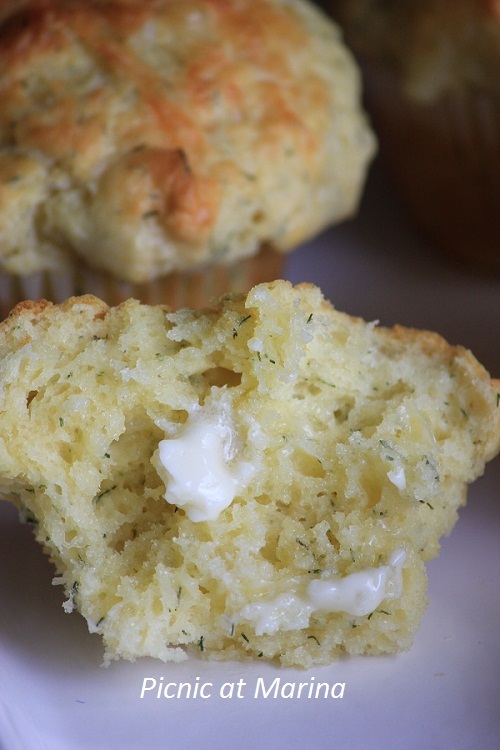 Grease a 12 cup muffin pan with butter. 2. In a large bowl combine together the flour, salt, baking powder, and dill. Stir and set aside. 3. In another bowl , whisk the eggs, then add oil and milk and whisk again. 4. Make a well in the middle of the dry mixture, add the egg mixture and shredded cheese (any cheese of your choice), and mix all ingredients. Do not overmix! 5. Fill the cups with the batter, and level it with the rim. 6. Place in the middle rack in the oven, and bake 20-25 minutes. When muffins are golden brown in color and springy to the touch, insert a toothpick in the center: it should come out clean. Cool it for 5 minutes (if you can), and enjoy with butter or raspberry jam. * This recipe was highly adapted from The WS Baking Book. These muffins look delicious, beautiful photos too! 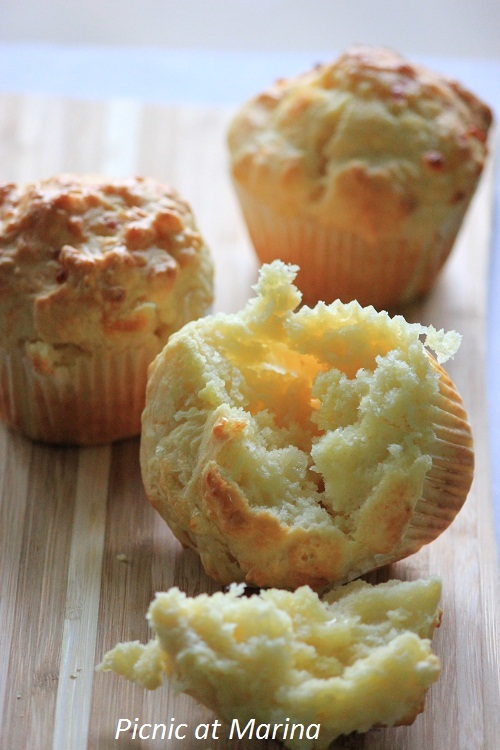 Marina, what charming photos of beautifully textured savory muffins! I know I will enjoy these, flavored with good olive oil and dill from my garden. Thank you! So mouthwatering especially looking at that final photo. These look so good, you're making me hungry! :) I have some to share, my friend! I think I smell them! These look so good, I'm going to have to make them. Thanks Marina! You have got me ready to crank up my oven and make muffins! These look amazing! I bet fresh herbs of any variety would also be delicious! 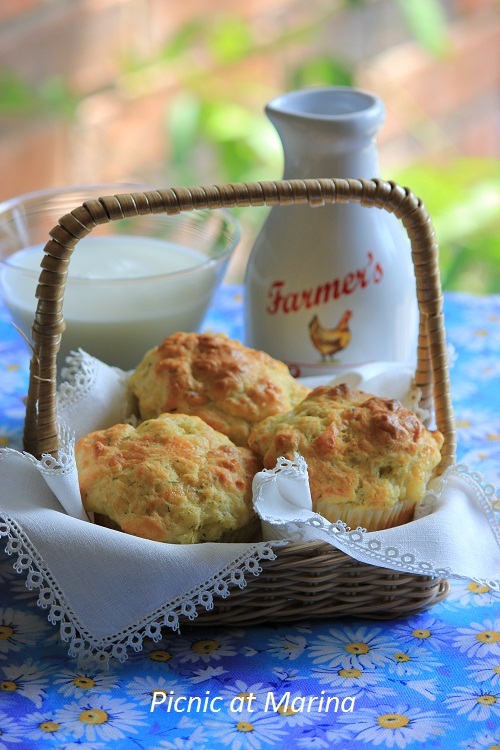 Those muffins sure look light, fluffy and tender, a thin layer of butter is all that I would need. There are few things in life better than homemade muffins slathered with butter. These look absolutely scrumptious! The testure of those looks perfect - lovely combination of cheeses too. These are just perfect, Marina, and love that the recipe calls for olive oil. I bet the aroma that fills your kitchen while they bake is wonderful. I don't now how you can wait 5 minutes for them to cool, though. Sounds near impossible, to me. very yummy this muffins. I would have them for lunch with a salad. Yum! These are gorgeous. My hubs would go nuts for these. Those look great Marina. I thought they were scones at first... then I suddenly realised they were muffins. With cheese no less! How cool is that? Love your little basket too... so pretty. Great looking muffins, so moist and soft. Loved the addition of cheese in them. Will bookmarked this for later. Thanks for sharing. Gorgeous muffins. I love savoury cheesy muffins.